A survivor of Sunday’s rains, Mr Kwabena Kwamenah, has disclosed that the number of dead persons maybe more than seven. 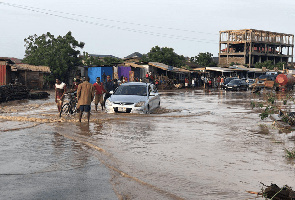 The National Disaster Management Organisation (NADMO), has confirmed that seven persons died as a result of the rains. Four bodies were found at Adjei Kojo in Ashaiman while one was found at Odawna, the Public Relations Officer of NADMO, Mr George Ayisi told Benjamin Akakpo said in an interview. The deceased included a six-year-old who was swept away by the floods and a soldier and his wife. Meanwhile, the survivor who lost his wife and 3 -year-old son to the flood has said the dead persons maybe more than seven. Mr Kwabena who was onboard a vehicle with 16 others on their way from a funeral, had their vehicle trapped after a minor accident. He told Kwabena Agyapong that because of the heavy downturn, the streets had become slippery and the driver who was manning the vehicle was also driving at a top speed. Mr Kwabena said he managed to survive with some 10 others but his wife and 3-year-old son, drowned and efforts to retrieve their bodies, failed. The body of the wife he disclosed was retrieved on Monday but the body of his son, has not been retrieved. Mr Kwabena told Rainbow Radio’s Kwabena Agyapong that he believes his son maybe dead.